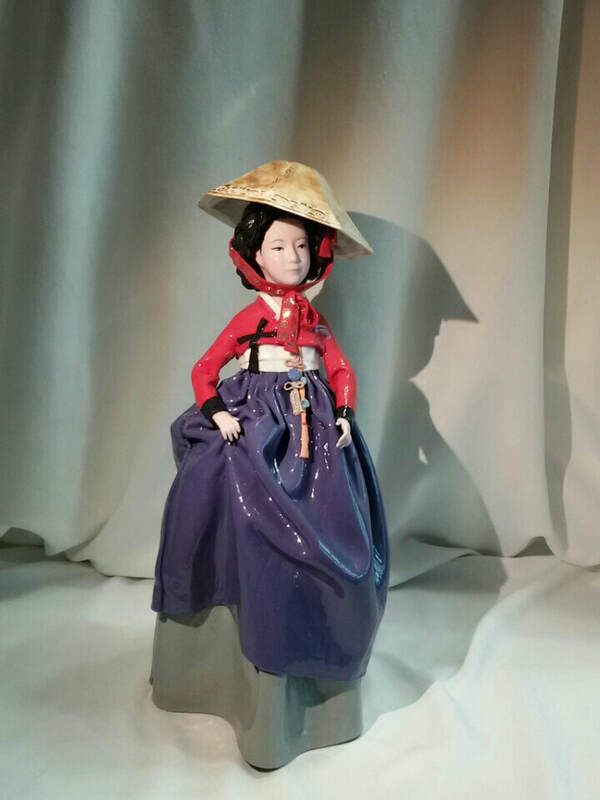 “After seeing many of Europe’s porcelain figurines such as Spain’s LLadro and Germany’s Meissen, I wanted to recreate Korea’s traditional costumes onto porcelain figurines. The hope to pioneer a new area was also a huge part as well … ” This was what the female ceramist Ju-hyun Oh concluded as she travelled through Vienna Austria. It became the starting point for her creating porcelain figurines embodying the Korean sentiment. In order to produce her unique porcelain figurines, the artist conducts extensive in-depth studies of Korean traditional costumes (hanbok), the living patterns and lifestyle of the Chosun Dynasty’s nobility and so forth. Throughout her studies, she searches and develop the notion of Korean traditional beauty; and later strives to portray its essence onto her works. The artist also projects the historical, periodical and permanent qualities of the Korean traditional costumes/clothing (hanbok). The different clothing designs unveil the various hidden stories of females from the Chosun Dynasty, reflecting the joys and sorrows females experienced as well as how they faced against the customs of that period. The artist’s works are the result of a long and enduring process. Her pieces are fired three times in a kiln that goes over 1250 degrees, the same temperature used to produce Korea’s traditional vases Cheongja (Celadon) and Baekja. Moreover, the meticulous and delicate details of the figurine’s fabric and accessories are more often unable to withstand the high temperature and breaks down in the kiln. Yet the artist continues to experiment and endeavors to create figurines with more intricate details and sophistication, while reflecting the hidden stories of the traditional costume – the female’s life and their way of challenging the conventional standards of their time.